Genome scale annotation of regulatory interactions and reconstruction of regulatory networks are the crucial problems in bacterial genomics. The Lactobacillales order of bacteria collates various microorganisms having a large economic impact, including both human and animal pathogens and strains used in the food industry. Nonetheless, no systematic genome-wide analysis of transcriptional regulation has been previously made for this taxonomic group. A comparative genomics approach was used for reconstruction of transcriptional regulatory networks in 30 selected genomes of lactic acid bacteria. The inferred networks comprise regulons for 102 orthologous transcription factors (TFs), including 47 novel regulons for previously uncharacterized TFs. Numerous differences between regulatory networks of the Streptococcaceae and Lactobacillaceae groups were described on several levels. The two groups are characterized by substantially different sets of TFs encoded in their genomes. Content of the inferred regulons and structure of their cognate TF binding motifs differ for many orthologous TFs between the two groups. Multiple cases of non-orthologous displacements of TFs that control specific metabolic pathways were reported. The reconstructed regulatory networks substantially expand the existing knowledge of transcriptional regulation in lactic acid bacteria. In each of 30 studied genomes the obtained regulatory network contains on average 36 TFs and 250 target genes that are mostly involved in carbohydrate metabolism, stress response, metal homeostasis and amino acids biosynthesis. The inferred networks can be used for genetic experiments, functional annotations of genes, metabolic reconstruction and evolutionary analysis. All reconstructed regulons are captured within the Streptococcaceae and Lactobacillaceae collections in the RegPrecise database (http://regprecise.lbl.gov). Regulation of gene expression in response to external and internal stimuli is a crucial mechanism for adaptation of microorganisms to changes of environmental conditions and intracellular states. In Bacteria, regulation of gene expression at the transcriptional level is usually mediated by transcription factors (TFs) that recognize their cognate TF-binding sites (TFBSs) in the promoter regions of regulated genes. A set of target genes under direct control of a certain TF is defined as a regulon. All regulons in a single organism establish the transcriptional regulatory network (TRN), a fine-tuned system for complex regulation of gene expression in response to environmental changes and physiological needs of the cell. Reconstruction of TRNs in bacterial genomes involves identification of regulatory interactions between target operons and TFs that requires genome-wide definition of all respective TFBSs. Various approaches for TRN reconstruction have been developed including traditional bottom-up genetic methods[1–3] and new top-down techniques based on the large-scale expression data and/or automated inference of TFBS motifs[5–8]. On the other hand, the growing number of available complete genomic sequences opens opportunities for comparative genomic analysis of transcriptional regulation and subsequent TRN inference (reviewed in[9, 10]). This analysis can be efficiently used for both propagation of known regulons to previously uncharacterized organisms and for ab initio discovery of novel regulons. Combination of the comparative genomic-based regulon reconstruction with other genome context analysis techniques and multiple available experimental datasets define a knowledge-driven approach for reconstruction of TRNs in a set of related bacterial genomes. This approach has been successfully used for TRN inference in two groups of related genomes including 16 Shewanella species and six species from the Staphylococcaceae family. The comparative genomics approach not only allowed us to reconstruct TRNs in multiple genomes but also resulted in prediction of functions for previously uncharacterized genes. In this study, we applied the knowledge-driven comparative genomic approach for reconstruction of TRNs in lactic acid bacteria belonging to the Lactobacillales order of the Firmicutes phylum. 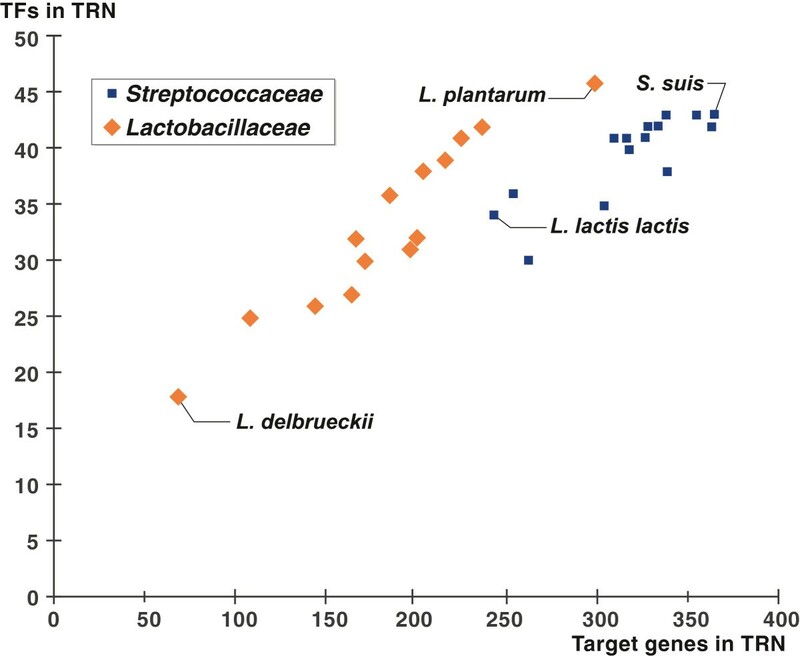 In spite of the large number of complete genomes and huge economic impact of this group (reviewed in[13–15]), most studies of gene regulation in these bacteria are limited to individual regulons in some model species; large-scale TRN reconstructions were attempted for Lactobacillus plantarum and Lactococcus lactis. On the other hand, availability of complete genomic sequences and multiple experimental data on gene regulation provide an opportunity for application of comparative genomic-based techniques for reconstruction of TRNs in lactic acid bacteria. To reconstruct genome-wide TRNs in the set of 30 Lactobacillales genomes we used a modified approach with three innovations. First, we subdivided the analyzed group of genomes into two phylogenetically distinct groups: the Streptococcaceae group including species from the Streptococcus and Lactococcus genera, and the Lactobacillaceae group that also includes two closely-related genomes from the Leuconostocaceae family. Second, to compose the initial training sets of TF-regulated genes we used the available experimental data on transcriptional regulation from 14 model species. Third, the coordinated reconstruction of a large number of TF regulons was carried out by a community of annotators using the RegPredict platform with subsequent curation and quality control. Using this combined approach we reconstructed regulons for 102 orthologous TFs, including 47 novel regulons predicted for the first time in this study and awaiting further experimental validation. We selected a set of 30 complete genomes in the Lactobacillales order for TRN reconstruction. Based on the phylogenetic species tree (Additional file1) all studied genomes were divided into two groups called the Streptococcaceae and Lactobacillaceae. The Streptococcaceae family includes 13 Streptococcus spp. and 2 strains of Lactococcus lactis. The second group includes 13 genomes from the Lactobacillaceae family and 2 genomes form the Leuconostocaceae family that are phylogenetically close to each other. To estimate the scale and diversity of the TF mediated regulatory networks in the Lactobacillales genomes, we performed a genetic census of their putative DNA-binding TFs using similarity search and the existing prokaryotic TF compilations (Additional files2,3). The total number of putative TFs varies broadly within the Lactobacillales genomes, from ~60 in S. thermophilus and L. helveticus to ~240 in L. plantarum and ~150 in S. gallolyticus (Additional file4). The putative TFs identified in the Lactobacillales are distributed between 49 protein families and about 90% of these TFs belong to 24 major families with at least two representatives per genome. The largest number of TF representatives was observed for the Xre family (298 TFs total, ~19 TFs per genome). Among other large families with more than 4 TFs per genome are the TetR, GntR, MarR, OmpR, LacI, LysR, MerR and AraC families. Comparison of TF repertoires between the two Lactobacillales groups reveals 42 TF families that have representatives in both groups. Among the lineage-specific TF families, three families (CodY, PF04394, YobV) are present only in the Streptococcaceae, whereas four families (LexA, SdaR, SfsA, ComK) are unique for the Lactobacillaceae. Interestingly, the LexA and CodY regulators are both present in the Staphylococcaceae, Bacillaceae, and Enterococcaceae families of Firmicutes, suggesting the family-specific loss of these TFs and their regulons in the Streptococcaceae and Lactobacillaceae families, respectively. The entire set of 3445 TFs identified in 30 studied genomes was broken into 596 orthologous groups in the Streptococcaceae and 640 orthologous groups in the Lactobacillaceae (Additional files2,3). The numbers of universal TFs present in all analyzed Streptococcaceae and Lactobacillaceae genomes are 21 and 8, respectively (Figure 1). At that, only 5 regulators are shared between these two groups of universal TFs including the global regulator for catabolite repression CcpA[20, 21], the copper uptake regulator CopR, the purine biosynthesis regulator PurR, the redox control global regulator Rex, and the aminosugar utilization regulator NagR. In each taxonomic group we defined all TFs that are present in more than half of the analyzed genomes as conserved TFs. Among the conserved TFs, 47 are shared by both studied lineages, whereas the Streptococcaceae and Lactobacillaceae groups have respectively 22 and 12 conserved TFs that are lineage-specific. The regulators of carbohydrate and amino acid metabolism form the most populated functional group of conserved TFs (Figure 1). Distribution of TF orthologous groups in studied genomes. (A) Distribution of TF orthologous groups in genomes. Conserved TFs are present in more than half analyzed genomes within the lineage. Universal TFs are present in all genomes of the lineage. (B) Examples of functional annotations for conserved TFs. TFs for which regulons were reconstructed are shown in bold, other TFs are underlined. TFs universally conserved in at least one lineage of the Lactobacillales are highlighted in green. The studied two taxonomic groups of lactic acid bacteria demonstrate different distributions of orthologous TFs. The fractions of universal and conserved TFs are significantly higher in the Streptococcaceae than in the Lactobacillaceae. On the other hand, the Lactobacillaceae genomes are equipped by a confidently higher fraction of sporadically distributed TFs that are present in 2 to 6 genomes. Thus, the Lactobacillaceae are characterized by higher variability of TFs orthologous groups than the Streptococcaceae that is in correspondence with the larger phylogenetic distances between species in the Lactobacillaceae family (Additional file1). A comparative genomic approach implemented in the RegPredict Web server was applied for regulon inference in the Streptococcaceae and Lactobacillaceae groups of genomes. Totally, 102 orthologous TF regulons were reconstructed in the studied genomes (Additional file5). Initially we collected the published experimental data on transcriptional regulation in model Lactobacillales species (Additional file5). Depending on the availability of experimental data, we applied three different workflows for regulon inference: (1) expansion and projection of TF regulons previously characterized in Lactobacillales, (2) the reconstruction of regulons for TFs that have orthologs previously characterized in B. subtilis or S. aureus, and (3) ab initio inference of regulons for previously uncharacterized TFs (Figure 2). Workflows used for regulon inference. Venn diagrams show numbers of regulons reconstructed by every approach: white background, regulons shared by both lineages; blue background, Streptococcaceae specific regulons; red background, Lactobacillaceae specific regulons. A significant number of the studied Lactobacillales genomes, including eight Streptococcus, two Lactococcus and four Lactobacillus species, were considered as model species with previously characterized TFs and regulons (Additional file5). 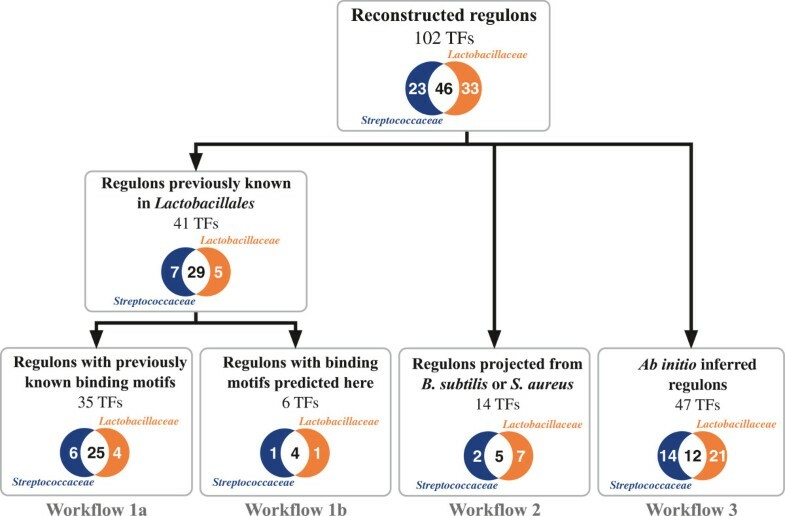 By using workflow 1, we propagated the previously established regulatory interactions for 41 TFs in the model Lactobacillales species, and predicted new regulon members by the comparative genomics approach. Using workflow 2, we inferred regulons for twelve TFs that have orthologs previously experimentally investigated in B. subtilis and two TFs that were previously studied in S. aureus. Finally, using workflow 3, we predicted and described 47 novel TF regulons (Figure 2). Thus, all TF regulons studied in this work are either entirely predicted by computational analysis regulons or partially predicted regulons with some regulatory interactions supported by experimental data in model species. The resulting set of reconstructed regulons varies drastically between the individual genomes (Table 1). The average number of reconstructed TF regulons per genome is 35.8, whereas the minimal and maximal numbers are 18 and 46 that were inferred in L. delbrueckii and L. plantarum, respectively (Figure 3). An average regulatory network of the reconstructed TF regulons includes ~250 genes per genome. The minimal number of genes in a reconstructed TRN was observed in L. delbrueckii (69 genes), whereas the maximal number of regulated genes in a network was in S. suis (366 genes). In summary, the number of regulated genes in the reconstructed TF regulons is significantly higher in the Streptococcaceae genomes. However, L. plantarum from the Lactobacillaceae group has numbers of TFs and target genes in the reconstructed TRN comparable with Streptococcaceae. The observed variability in reconstructed TRNs of studied microorganisms can be explained by multiple factors including the diversity of their respective ecological niches and nutrient availability, and different metabolic capacities of individual species. 1Numbers of orthologous groups of TFs, genes and operons in lineage. Scatter plot for numbers of TFs and target genes in studied genomes. Genomes with minimal and maximal numbers of target genes in each lineage are signed. Distribution and properties of 102 TF regulons in 30 genomes of the Lactobacillales are summarized in Additional file5. In each of the two taxonomic groups, the Streptococcaceae and Lactobacillaceae, we defined TF regulons that are universal (i.e. present in all 15 genomes) and the remaining regulons with a mosaic distribution in the analyzed genomes (Table 2). Only five regulons including the global regulons CcpA and Rex were found to be universally conserved in both lineages. Ten regulons that are universal in the Streptococcaceae have orthologs with mosaic distribution in the Lactobacillaceae. In contrast, no TF regulons appeared in the group of regulons that are universal in the Lactobacillaceae but mosaic in the Streptococcaceae. A large set of 31 TF regulons that are mosaic in both lineages contains regulons controlling different sugar utilization pathways. Numbers of regulons for orthologous TFs in Streptococcaceae and Lactobacillaceae are shown. 1 ‘Universal’ regulons are present in all 15 studied genomes of the group; ‘Mosaic’ regulons are present in group but in less than 15 genomes; ‘―’ means the absence of regulons in this group. The remaining TF regulons reconstructed in this work are present only in a single taxonomic group. Among 23 TF regulons present solely in the Streptococcaceae, the CmbR, CodY and PipR regulons are universal, whereas the others have a mosaic distribution in 15 analyzed genomes. The SOS response regulon LexA is only linage-specific regulon that was identified as universal in the Lactobacillaceae, whereas the remaining 20 lineage-specific TF regulons have a mosaic distribution in this lineage. In conclusion, 23 TF regulons are specific for the Streptococcaceae, 33 regulons are present only in the Lactobacillaceae and 46 regulons have orthologs in both lineages. Thus, among the reconstructed regulons, the Streptococcaceae group has significantly larger number of universal TF regulons in comparison with the Lactobacillaceae group. The reconstructed regulons are controlled by TFs from 31 protein families. The mostly represented TF family in the obtained set of regulons is the LacI family (26 regulons). As expected, all LacI family regulons reconstructed in this work controls different carbohydrate utilization pathways. Another broadly represented TF family is GntR family (13 regulons) that control carbon and amino acid metabolisms and resistance to toxic compounds. TFs from the TetR and MarR families (7 and 6 reconstructed regulons, respectively) regulate genes involved in environmental adaptation, multidrug and heavy metal resistance and fatty acids metabolism. The reconstructed regulons from the RpiR family control various carbohydrate utilization pathways (5 regulons), whereas the predicted AguR regulon controls the agmatine utilization pathway. The BglR and DeoR families of TFs include respectively 6 and 5 regulators that control carbohydrate catabolism. Three regulons operated by TFs from the LysR family regulate the cysteine/methionine metabolism, whereas one regulon (MleR) controls the malonate utilization pathway. The functional gene content was assessed for each reconstructed TF regulon to tentatively predict its possible biological function and molecular effector. Metabolic reconstruction of the respective biochemical pathways and prediction of functions of co-regulated genes were performed using the subsystem-based approach implemented in the SEED genomic platform[25, 26]. The inferred functional annotations of genes constituting regulons were captured in the RegPrecise database within the taxonomic collections of regulons for the Streptococcaceae and Lactobacillaceae groups (http://regprecise.lbl.gov/RegPrecise/collections_tax.jsp). Overall, the reconstructed regulons were classified into 8 functional groups (Additional file5). The largest group counts 56 regulons for carbohydrate and central carbon metabolism. Three other functional groups of regulons are involved of stress response (11 regulons), metal homeostasis (9 regulons) and amino acid metabolism (8 regulons). Small numbers of regulons were reconstructed for cofactor metabolism (4 regulons), nucleotide metabolism (3 regulons) and fatty acid metabolism (2 regulons). Additionally, 9 reconstructed TF regulons contain genes with unknown or hypothetical functions, and thus their specific functional roles and effectors remain unknown. Functional content for the selected subset of reconstructed regulons is briefly described below. Carbohydrates comprise a key source of carbon and energy for a variety of microorganisms. Genomes from the Lactobacillales order encode a large number of sugar catabolic pathways and most of these pathways have a mosaic distribution in individual species. This diversity of sugar catabolic pathways is matched by a large number of regulatory systems that allow sugar-specific induction of expression of these pathways. Here we reconstructed 56 TF regulons that control the sugar and central carbon metabolism in the Lactobacillales. In addition to 19 sugar metabolism regulons that were previously characterized experimentally in model Lactobacillales species, 6 regulons were reconstructed by projection from B. subtilis or S. aureus and 31 novel regulons were predicted for the first time in this work (Additional file5). Analysis of available experimental data revealed 114 previously known regulatory interactions involving the sugar metabolism regulators in model Lactobacillales organisms. Using comparative genomics, we were able to significantly expand the sugar metabolism regulatory subnetwork. As an example, the previously known regulator of hyaluronidase RegR in S. pneumoniae was predicted to have an expanded regulon of 12 additional genes involved in the hyaluronate utilization that is conserved in six Streptococcaceae genomes (Additional file6). About 10 new regulatory interactions per genome were predicted for carbohydrate metabolism genes using the projection of known regulons from B. subtilis and S. aureus. For example, CcpN in B. subtilis was previously described as a regulator of the gluconeogenesis genes gapB and pckA. The comparative genomics reconstruction of the CcpN regulon revealed the pyruvate phosphate dikinase ppdK, the ccpN gene and the fructose biphosphatase fbp as novel members of the CcpN regulon in the Lactobacillales (Additional files6,7). Thus, the novel CcpN regulon in the Lactobacillales have a set of target genes that is completely different from the known CcpN regulon in B. subtilis, although in both lineages it controls the gluconeogenesis pathway. The reconstructed regulatory network includes 52 TFs that control 38 peripheral sugar utilization pathways, and 10 of these pathways are controlled by more than one TF. For instance, we reconstructed 5 different TF regulons for maltose and maltodextrin utilization pathway and 3 TF regulons for the sucrose catabolism. Two different TF regulons per one sugar metabolic pathway were described for pathways involved in utilization of ascorbate, cellobiose, gluconate, lactose, N-acetylgalactosamine, ribose and trehalose. The observed redundancy in sugar-specific TFs is explained by (i) non-orthologous replacements of TFs for the same pathway in different genomes, and (ii) existence of alternative pathway variants and multiple paralogs regulated by different TFs in the same genome. For example, two maltose/maltodextrin ABC transporters are controlled by two non-orthologous TFs from the LacI family in the Streptococcaceae (Additional file8). The malEFG operon is always regulated by MalR protein. The malXCDA operon is regulated by MalR in four Streptococcus spp. and under control of MalR2 in three other Streptococcus spp. Three other sugar utilization pathways in the Streptococcus spp. are equipped by a redundant set of catabolic genes controlled by multiple non-orthologous regulators. SgaR and SgaR2 from the BglG family control the ascorbate utilization. The GntR family regulators AgaR and AgaR2 were predicted to control the N-acetylgalactosamine utilization gene loci. The cellobilose utilization genes are regulated by CelR from the BglG family and CelQ from the ROK family. These functionally redundant sets of TF regulons indicate a complex evolutionary history of the sugar utilization subsystems in Firmicutes. We reconstructed totally 11 TF regulons involved in various stress responses and drug resistance. These include the CtsR, HrcA, NmlR, PadR and PerR regulons that were previously experimentally described in at least one model Lactobacillales genome. The SOS response regulon LexA and multidrug resistance regulon YtrA were projected using the previous knowledge of orthologous regulons in B. subtilis[33, 34]. Overall, we predicted 13 target operons in the Lactobacillaceae LexA regulon including some novel functions (e.g. parEC, addBA, nrnA). The Fur family regulator PerR was previously studied in S. pyogenes and S. suis, where it co-regulates genes involved in peroxide stress response and manganese transport[35, 36]. Here we predicted some new members of the PerR regulon involved in iron transport (fhuADBG, feoAB, fatDCAB) and iron-sulfur cluster biosynthesis (sufCDSEB). The latter iron-sulfur cluster biosynthesis operon was previously identified by us as a novel member of the PerR regulon in the Staphylococcaceae family. Interestingly, we also predicted that in some Streptococcus spp., PerR controls expression of another TF for manganese homeostasis, MntR, and these two regulators form a potential cascade. The group of reconstructed regulons for metal homeostasis includes 9 TF regulons. Starting from 24 regulatory interactions previously described in 5 known regulons for model Lactobacillales organisms, we expanded and projected the AdcR, CopR, FlpA, MntR and SczA regulons resulting in prediction of several new regulatory interactions in the genomes. For instance, we predicted regulation of genes encoding manganese (mntH) and nickel (nikABCDE) transporters, heavy metal-transporting ATPase (pmtA), and mntR gene by the manganese homeostasis regulon MntR in the Streptococcaceae. In contrast to the AdcR regulon for control of zinc homeostasis in the Streptococcaceae, the Lactobacillaceae species utilize the typical zinc-responsive regulator Zur from the Fur family. The Zur regulon in the Lactobacillaceae, which was reconstructed by projection from the B. subtilis Zur regulon, includes the zinc transporter znuABC, and the zur and rpsN2 genes, the latter encoding a paralog of the ribosomal protein S14. Two novel TFs from the ArsR family analyzed in the Lactobacillaceae are distantly related to the CzcR regulator of cobalt-zinc-cadmium resistance from Pseudomonas aeruginosa. The reconstructed CzcR1 and CzcR2 regulons were predicted to control different sets of genes involved in heavy metal resistance. Another novel regulon, termed NihR (ni ckel h omeostasis r egulator), was predicted by its conserved co-localization with the nikMQO genes encoding a nickel transport system. The predicted NihR regulon also includes the nihR and nixA genes, the latter encoding a high-affinity nickel permease (Additional file7). Among 8 reconstructed TF regulons for control of amino acid metabolism, seven regulons have been previously described in at least one model Lactobacillales species. For these TF regulons, we projected 56 regulatory interactions to additional genomes and predicted ~25 novel regulatory interactions per genome. First, we predicted the MtaR- and CmbR-dependent regulation of the mmuMP operon involved in S-methylmethionine utilization in the Streptococcaceae. Second, we identified multiple new members of the nitrogen metabolism regulon GlnR in both lineages including the glutamine transporter gluQHMP, the arginine catabolism genes arcABC and the aspartate-ammonia ligase asnA. A novel amino acid metabolism regulon that was inferred for the first time in this work is operated by a RpiR-like regulator, termed AguR (a gmatine u tilization r egulator), which was found to be co-localized with agmatine utilization genes in the Lactobacillaceae genomes. CRISPR-Cas is a recently discovered prokaryotic RNA-based system for adaptive immunity for defense against phages, plasmids and other mobile genetic elements[38, 39]. Previously, the expression of CRISPR-Cas genes has been shown to be regulated by different global TFs, such as H-NS, Lrp, LeuO[40, 41] and Crp in E. coli, and Rex in Thermotoga maritima. In this work we predicted some new cases of regulation of CRISPR-Cas genes in the Lactobacillales genomes. The predicted operon cas9-cas1-cas2-csn2 is preceded by a candidate CcpA-binding site in S. agalactiae and S. mutans, whereas in S. agalactiae and S. equi this operon has a candidate CodY-binding site in its promoter region. Another putative CRISPR-Cas operon, cas5-cas8c-cas7-cas1-cas2, is predicted to be regulated by CcpA in S. equi and S. pyogenes. These predicted regulatory interactions for CRISPR-Cas genes extend our understanding of regulatory mechanisms for bacterial immune systems. Among 102 TF regulons reconstructed in this work, 46 regulons have orthologous TFs in both studied lineages of the Lactobacillales (Additional file5). We compared the deduced TFBS motifs for the orthologous TF regulons in the Streptococcaceae and Lactobacillaceae lineages and classified them into three categories (Additional file9). Category I includes 23 TF regulons with binding motifs that are well conserved or slightly variable in two lineages. Category II contains 17 TF regulons with moderately different motifs (2 to 4 mismatches in the conserved motif positions). Category III has 6 remaining TF regulons with binding motifs that are substantially different between the Streptococcaceae and Lactobacillaceae. Remarkably, the category I is enriched by universal and highly conserved regulators. Thus, it includes all 5 regulons that are universal in both studied lineages and 10 regulons for TFs that are universal in the Streptococcaceae and have a mosaic distribution in the Lactobacillaceae. The category I contains the highest number of global regulons (CcpA, Rex) and mid-size regulons that control 3 or more target operons per genome (AdcR, ArgR, CtsR, GlnR, HrcA, MalR, MtaR, PerR and PurR). The remaining 13 regulons in this category are local, i.e. containing less than 3 target operons per genome. In contrast, the categories II and III contain respectively 94% and 100% of local regulons. These observations suggest that the conservation of TFBS motifs have a positive correlation with the regulon size. Similar correlation was previously reported for the Staphylococcaceae spp.. Analysis of conservation of gene contents for orthologous TF regulons between the two studied lineages classified all regulons into three different categories. The first group contains 27 strictly conserved regulons that do not demonstrate any difference in their gene content or have only slight changes between the Streptococcaceae and Lactobacillaceae (e.g. an insertion of additional genes into target operons). The second group includes 16 regulons that have a common core of conserved genes supplemented by unique sets of peripheral genes that are substantially different between the Streptococcaceae and Lactobacillaceae . This group of partially conserved regulons includes the global regulons CcpA and Rex and several mid-size regulons (see below). The third group contains 3 orthologous regulons, MdxR, NiaR and NrtR, having completely different sets of target genes between the Streptococcaceae and Lactobacillaceae groups, although their corresponding biological roles are conserved between the studied groups. High diversity of the latter three regulons can be explained by redundancy of the respective metabolic systems and regulatory mechanisms. Thus, MdxR controls the maltose and maltodextrin utilization and the similar biological role was assigned to several other TF regulons in the Lactobacillales (see above). The phylogenetic distributions of two NAD metabolism regulons NiaR and NrtR have an overlapping pattern in many studied genomes (Additional file5). In conclusion, we did not observe any correlation between the conservation of orthologous TF regulon structure and their cognate binding motifs in the analyzed taxonomic groups. The 16 TF regulons with a common core and flexible set of peripheral genes between the Streptococcaceae and Lactobacillaceae groups can be classified into three subgroups: (i) regulons expanded in the Streptococcaceae (AdcR, BirA, CopR, GlnR, LacR and MntR); (ii) regulons expanded in the Lactobacillaceae (HrcA and ScrR), and (iii) regulons with different peripheral sets of genes in the Streptococcaceae and Lactobacillaceae (ArgR, CcpA, CtsR, MalR, NrdR, PerR, PurR and Rex). We prepose that different sets of peripheral genes in the above 16 regulons have appeared due to independent expansion of regulons in each lineage. A common core of the ArgR regulon is formed by genes for the arginine transport and biosynthesis. The periphery of this regulon in the Streptococcaceae consists of the argR gene and arcABC operon for arginine catabolism, whereas the extended part of the ArgR regulon in the Lactobacillaceae includes only carbamoyl-phosphate synthase (carAB). The PurR regulon in the Streptococcaceae is expanded by genes for metabolism of folate-associated one-carbon compounds, whereas in the Lactobacillaceae this regulon has additional genes for the adenine and guanine metabolism (purB and guaB) and ribose-phosphate pyrophosphokinase (prsA). Expansion of the PerR regulon in the Streptococcaceae affects genes for the iron and manganese homeostasis, whereas in the Lactobacillaceae PerR regulates several additional genes such as a NADH peroxidase. The CcpA regulon demonstrated the largest peripheral sets of genes in the studied lineages, 117 operons in the Streptococcaceae and 42 operons in the Lactobacillaceae. Noteworthy, the CcpA regulon in the Streptococcaceae is expanded by the CRISPR-Cas cassette genes (see above) and some virulence genes (the exfoliative toxin A gene shetA and the streptolysin S biosynthesis operon sagABCEFGHI), suggesting that this global regulon supplies the link between the carbohydrate utilization, virulence and anti-phage immunity. Functional analysis of reconstructed TF regulons in the Lactobacillales revealed that many biological processes are regulated by two or more non-orthologous TFs. These metabolic subsystems with redundant TF regulation include 8 distinct sugar utilization pathways (see above) and the zinc homeostasis that are controlled by 20 non-orthologous TFs (Additional file5). In most cases, patterns of phylogenetic distribution of non-orthologous TFs controlling the same biological subsystem complement each other in the analyzed 30 genomes. Interestingly, there are only four cases in which the non-orthologous TFs belong to different protein families (CelR/CelQ, GntR1/GntR2, LacR/LacR2 and AdcR/Zur), whereas in all remaining cases the identified pairs of non-orthologous TFs belong to the same TF family and thus can be classified as cases of xenologous gene replacement. The largest number of xenologous replacements of TFs was identified within the LacI family (Additional file8). The cross talk between TF regulons can be identified by prediction of TFBSs for two or more TFs within the regulatory region of the same operon. Numerous target operons in the reconstructed TRNs are subject to regulation by multiple TFs. For instance, S. preumoniae has 38 target operons that share TFBSs for two or more TFs. Regulation of several target operons by multiple TFs is evolutionary conserved across a number of related genomes (Table 3). Three global regulons, CcpA, CodY and Rex, often interconnect with each other and also with multiple local TF regulons. For example, the CcpA regulon overlaps with 31 TF regulons that control the carbohydrate utilization such as MalR, ScrR, TreR, GalR, FruR, and RegR. The CodY regulon overlaps with the GlnR and CmbR regulons that control the nitrogen metabolism and sulfur amino acid biosynthesis, respectively. A similar situation was previously observed in S. aureus, where the CcpA regulon overlaps with numerous local regulons for sugar utilization and the CodY regulon overlaps with amino acid metabolism regulons[12, 45, 46]. Similarly, co-regulation of two heat shock response regulons, HrcA and CtsR, was found both in the Streptococcaceae and Lactobacillaceae groups, and was also previously observed in S. aureus[12, 47]. Autoregulation of TFs is a regular feature of the reconstructed regulons. An average portion of the Lactobacillales TFs with predicted control of their own expression is 72%. This index slightly varies between the analyzed genomes and is very close to the percentage of autoregulated TFs that was previously reported for S. aureus. Multiple regulatory cascades between various TFs were detected in the studied genomes. For instance, CcpA regulates the codY gene and multiple genes encoding sugar utilization regulators, such as FruR, ScrR, TreR, and CelR. Among other identified cascades, CodY controls glnR, CmbR controls homR and PerR controls mntR in the Streptococcaceae, whereas CtsR controls hrcA in the Lactobacillaceae. Some cascades, such as the regulation of fruR, galR, gutR, mtlR, scrR and treR genes by CcpA, are conserved between the Streptococcaceae and Lactobacillaceae lineages, whereas the remaining cases of regulatory TF cascades are lineage specific. Comparison with the previously reconstructed regulatory network of S. aureus showed that some of the identified Lactobacillales regulatory cascades are also conserved in the Staphylococcaceae. For instance, the CcpA-dependent regulation of fruR, rbsR2, scrR and treR, as well as the regulation of glnR by CodY and hrcA by CtsR, are conserved between the two groups. The conservation of cascades between distantly related genomes points to the importance of these regulatory interactions in the Lactobacillales regulatory networks. The knowledge-based bottom-up approach and comparative genomics techniques have been previously successively applied for reconstruction of bacterial TRNs in different groups of genomes[11, 12]. Here we tentatively defined the reference collection of TF regulons in 30 Lactobacillales genomes comprised of 102 orthologous groups of TFs and ~4100 regulatory interactions (~140 per genome). The resulting regulatory network contains ~7500 regulated genes (~250 per genome) that are involved in sugar utilization, stress response, metal homeostasis and metabolisms of amino acids, fatty acids, nucleotides, and cofactors. We used a modified workflow for TRN reconstruction that is characterized by three main innovations: (1) analysis of two taxonomically related groups of genomes (the Streptococcaceae and Lactobacillaceae), (2) involvement of numerous experimental data from the literature about TF regulation in lactic acid bacteria, and (3) coordinated reconstruction of multiple TF regulons by a community of annotators using multi-user web interface of the RegPredict tool for regulon analysis. 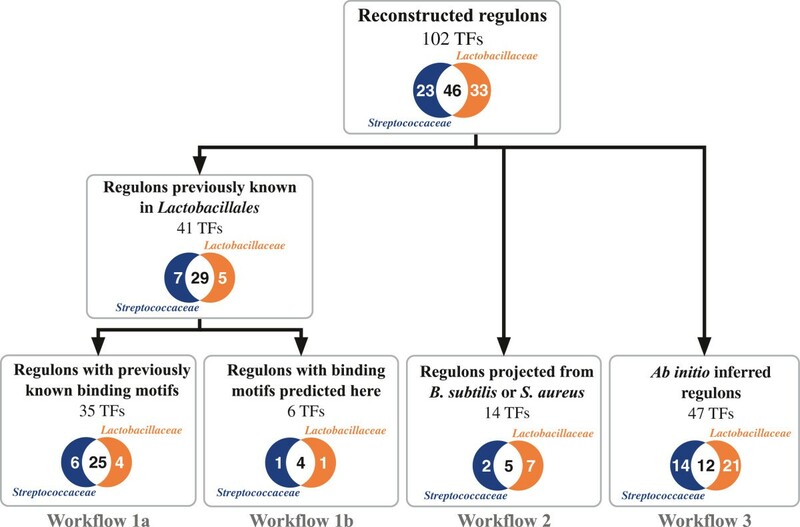 By utilizing the semi-automatic workflow for regulon inference combined with manual curation and regulon annotation we described the largest reference collection of TF regulons in lactic acid bacteria do date. The collection also includes the previously uncharacterized regulons for 47 TFs that comprise ~1000 target genes (12 – 63 genes per genome). Thus, a significant number of predicted regulatory interactions and novel TF regulons await future experimental validation. During preparation of this manuscript, Bitoun et al. experimentally analyzed Rex regulon in the S. mutans UA159 and confirmed Rex dependent regulation of 4 targets predicted in this work (adhE, rex-guaA, ldh, and frdCT). Comparison of the inferred TRNs in the Lactobacillales genomes reveals interesting trends in the evolution of TRNs and individual TF regulons. First, we found a positive correlation between the TFBS motif conservation between the two lactic acid bacteria lineages and the distribution and conservation of the respective TF regulons. Second, we report that in the analyzed collection of Lactobacillales regulons non-orthologous displacements of TFs occur more often between structurally related TFs in comparison with regulators that belong to different protein families. Thirty complete genomes of Lactobacillales (Additional file1) were downloaded from MicrobesOnline database. Primary TF sets for each studied genome were extracted from P2TF (http://www.p2tf.org) database. Sigma factors and RNA binding proteins were excluded from the collections. Groups of orthologs were pre-counted as following. Initially, groups of orthologous proteins were constructed for every pair of TFs sets. All pairwise comparisons were done using BLASTP, and bidirectional best hits (BBHs) were identified if the protein sequences identity was more 50% and the aligned region was longer than 2/3 of the length of the shorter protein. If two paralogous genes from one genome were more similar to each other than to a BBH partner from another genome, both paralogs were added to the same orthology cluster. Finally, all orthologous clusters containing common genes were joined together. The clusters were formed using ad-hoc software written using Oracle RDBMS Express Edition (PL/SQL codes are available by request). TF families were assigned by analysis of protein domain structure using the following databases: CDD, Pfam, SMART, and MicrobesOnline Domain and Families. For regulon reconstruction we used the previously established comparative genomics approach (reviewed in) implemented in the RegPredict Web server (http://regpredict.lbl.gov). The approach includes inference of TFBSs, construction of nucleotide positional weight matrices (PWMs) for TFBSs motifs, and reconstruction of regulons in complete genomes on the basis of prediction of putative TFBSs in promoter gene regions. To take into account possible lineage specific changes in TFBSs motifs, we constructed individual PWMs for the Streptococcaceae and Lactobacillaceae taxonomic groups. The three major workflows used for TF regulon reconstruction are (1) projection and expansion of previously known regulons from model Lactobacillales organisms, (2) projection of known regulons from model organisms belonging to another taxa, and (3) ab initio prediction of novel regulons (Figure 2). In workflow 1, the projection and expansion of previously know TF regulons includes two slightly different workflows. In workflow 1a, both a set of regulated genes and TFBSs motif are known, whereas in workflow 1b, only a set of co-regulated genes is known from the collected experimental data. For previously known TFBSs motifs, a PWM was built and used for identification of additional sites in the analyzed genomes using the Run Profile tool in the RegPredict Web server. All novel true positive TFBSs were added to the training set and the updated PWM was constructed and further used for final regulon reconstruction. For regulons with originally unknown TFBS motifs, we collected a set of upstream regions of known TF-regulated genes and their orthologs and used this set for TFBS identification by the Discover Profile tool in the RegPredict. The TFBS motif discovery tool uses the expectation-maximization algorithm for clustering of all potential motifs with a specified symmetry (palindrome, direct or inverted repeat) and finally optimizes the inferred PWM. In ambiguous cases, putative regulatory elements were validated by phylogenetic footprinting using multiple alignments for upstream non-coding regions of orthologous genes. In workflow 2, the previously experimentally studied regulons in other model organisms from the Firmicutes phylum (B. subtilis or S. aureus) were projected to the Lactobacillaceae genomes. For TFBS identification, we used training sets of upstream regions of genes that are considered as orthologs to the TF-regulated genes from other model species outside of the Lactobacillales lineage. Workflow 3 was used for ab initio prediction of novel TF regulons. Initially, the presumably co-regulated genes were predicted by the analysis of conserved gene neighborhoods around a putative TF gene. Upstream regions of presumably co-regulated genes extracted from multiple Lactobacillales genomes were used for identification of TFBSs and PWM construction as described above. The obtained PWMs for known or predicted TFBS motifs were used for comparative genomics reconstruction of regulons in two groups of genomes, the Lactobacillaceae and Streptococcaceae, using the RegPredict Web server. Each studied genome was scanned with the constructed PWMs using Run Profile tool in RegPredict. The threshold for site search was defined as a lowest score observed in the training set. The consistency check approach[10, 54] and/or functional relatedness of candidate target operons were used to eliminate false positive TFBS predictions. A community of annotators consisting of 18 undergraduate students from Hope College (Holland, MI) performed initial reconstruction of multiple TF regulons in the analyzed groups of genomes. This represented a coordinated annotation effort with expert curators in the context of a microbiology course. The resulting draft regulons underwent strict quality control to ensure accuracy of the reconstructions. Functional gene annotations were uploaded from SEED, UniProt and MicrobesOnline. Multiple alignments of protein and DNA sequences were built by MUSCLE. Phylogenetic trees were constructed using maximum likelihood algorithm implemented in PHYLIP package (v 3.69) and visualized via Dendroscope tool. Complete description of the reconstructed regulons including TFs, their target genes and operons, and associated TFBS were uploaded to the RegPrecise database (http://regprecise.lbl.gov). This work was supported by the Office of Science, Office of Biological and Environmental Research, of the U.S. Department of Energy under contract DE-SC0004999 with SBMRI and LBNL. Additional funding was provided by the Russian Foundation for Basic Research (12-04-33003 and 12-04-31939), State contract #8135 (application 2012–1.2.2-12-000-1013-079) to MDK, and by the National Science Foundation under award DBI-0850546 to AAB and DARo. We would like to thank the students of the Fall 2011 Microbiology course at Hope College for their work to build initial reconstructions of regulons. DARo and PSN conceived and designed the research project. DARa and DARo wrote the manuscript. DARa, DARo, and NVS performed comparative genomic analysis for reconstruction of regulons. DARo also provided the quality control as a curator. MDK computed orthologous clusters for TFs. AAB contributed to the development of the project, writing of the manuscript, and implemented the community annotation effort at Hope College. All authors read and approved the final manuscript.